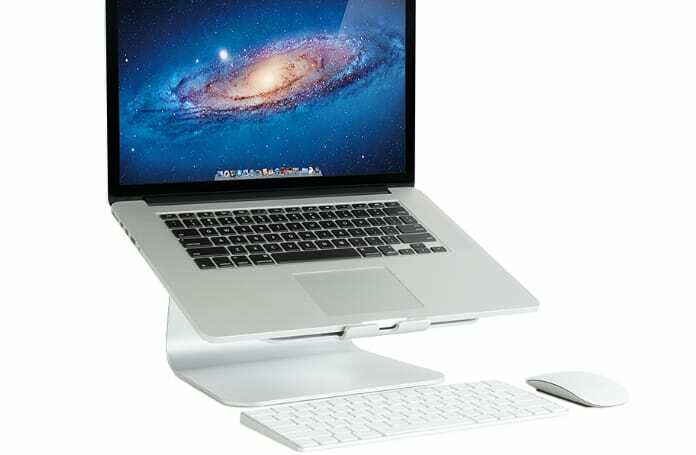 The right MacBook stand can make create a comfortable setting for your work environment. It can also keep the MacBook safe from overheating. Unlockboot has researched, vetted and tested multiple MacBook stands to help you identify the right ones for your office, or to take along with you for working remotely. Tiny Tower is a beautifully designed, durable laptop stand that can be folded with ease (it’s just one inch think in its folded state). You can put the MacBook on its two arms which feature silicone padding to prevent the PC from slipping. In addition to the padded feet, it has the capability to raise a PC 7-10 inches off a table. Other than that, it features a zipper case that can accommodate your headphones as well as USB cables. Separately, a bigger zipper case can be bought to put other items like charging cable, mouse, keyboard, etc. The Tiny Tower Laptop Stand is available in the following colors: gold, silver, rose gold, and space grey. This stand for MacBook costs $79.99. The mStand is an Amazon best-seller. It’s made of aluminum and comes with a cable organizer and style that promotes good airflow around the laptop. It’s also strong and stable, so it’s unlikely to break easily if it’s unknowingly dropped. It can also be combined with a 360-degree swivel stand (for up-charges), as well as accommodate a mouse and a wireless keyboard on its base. Another benefit is that you get the option to choose from three colors: silver, gold, and gray to match your laptop’s skin. 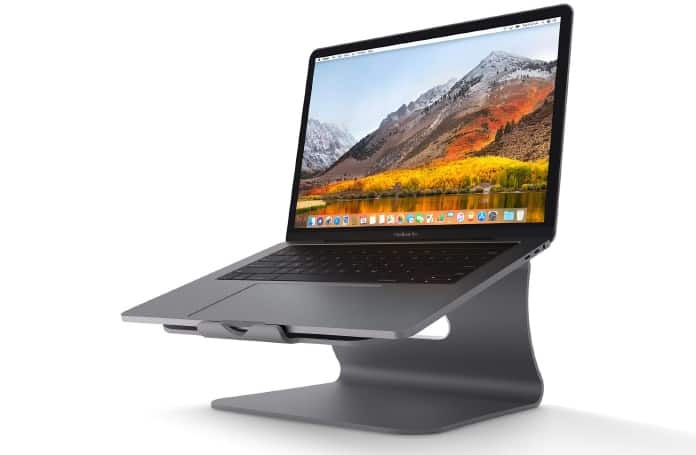 If you’re looking for a premium stand that’ll keep your MacBook stable and you have some money to shell out, the Roost stand won’t disappoint. Its one of the most well-made and adjustable stands out there. It’s quite easy to set up, and can be adjusted to the user’s ideal height. Plus, it is lightweight, so it’s unlikely to take up a lot of space in a laptop bag, which means it is perfect for using in airport lounges and cafes. Other features include a nonslip feet that keeps the MacBook stable, and a small carrying case that adds to its sleekness. You can buy it for $74.95. 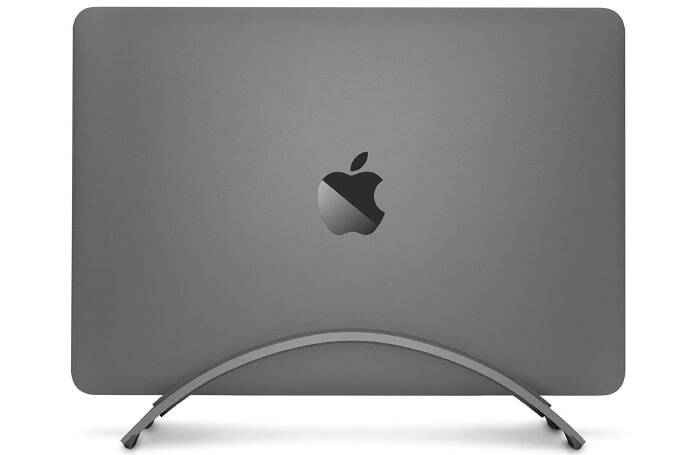 This is a neat MacBook cradle that you can buy in either a wood or aluminum finish. It saves space and can elevate the laptop, protecting it from a spill if you hook it into a third-party monitor. The metal version goes a long way in complementing the MacBook, and is available in space grey and black colors. Plus, it features a neat hook that keep the cables of the notebook secure and organized. This stand is priced at $49.99. 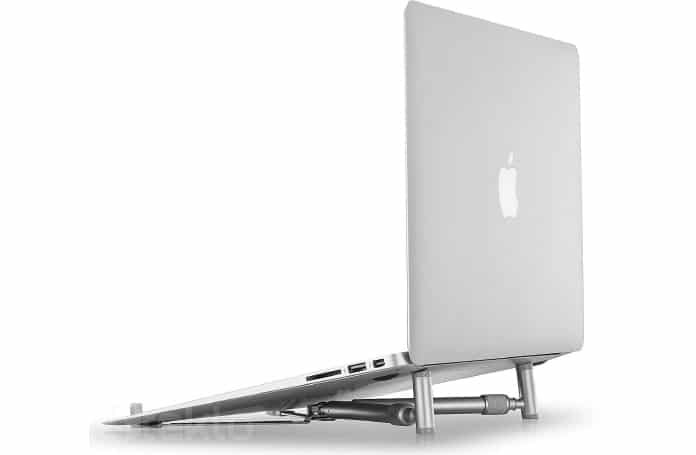 This stand raises the MacBook slightly for a good viewing & cooling experience. It keeps the PC cool during strenuous activities and significantly improves the quality of airflow. And when the user doesn’t need it, it folds into a stand for easy transport and viewing. Its just 6 inches long and weighs below six ounces, which makes it ideal for using in places like bus, train, airport, and coffee shops. You can buy the Steklo X-Stand for $29.99. 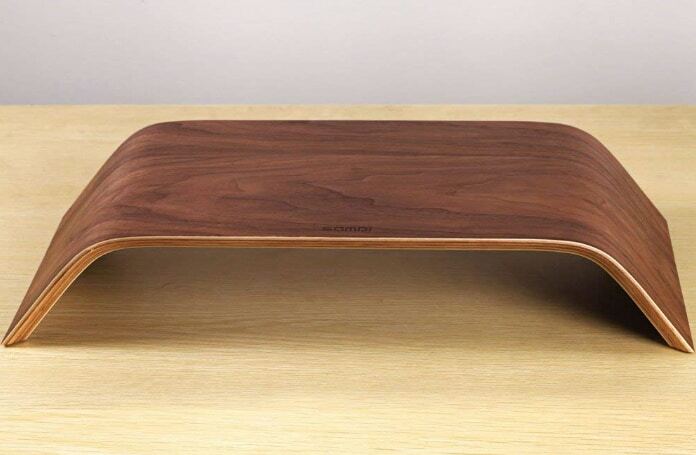 As evident from its name, the Grovemade stand is a handcrafted premium stand that was made in Oregan with vegetable-tanned and walnut leather, so it should do a great job at protecting a MacBook from scratches. It is beautiful to touch and look at. 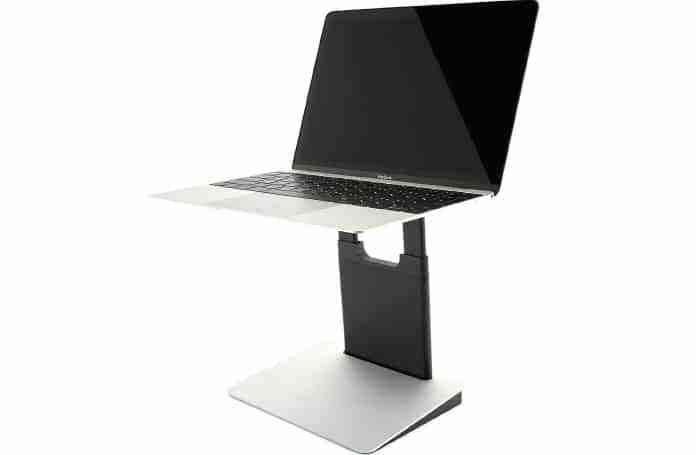 Plus, it can accommodate laptops up to 200 pounds (total weight that the stand is capable of accommodating). And just in case you want to spend more, there’s an entire range of desktop accessories that Grovemade has made available for matching this stand. There’s even a maple version available. You can buy this stand for $139.00. 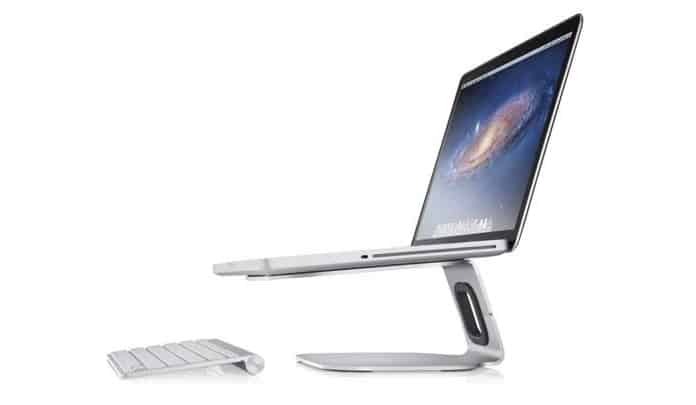 This is a sleek aluminum MacBook stand that can hold any laptop, whether it comes from Apple or another brand. It has an open-ended design, as well as a cable-management ring. The first of these features contributes to the smooth airflow in and around the laptop. Additionally, the Loft holder from Belkin features a rubber base that keeps the device secure and prevents slippage. 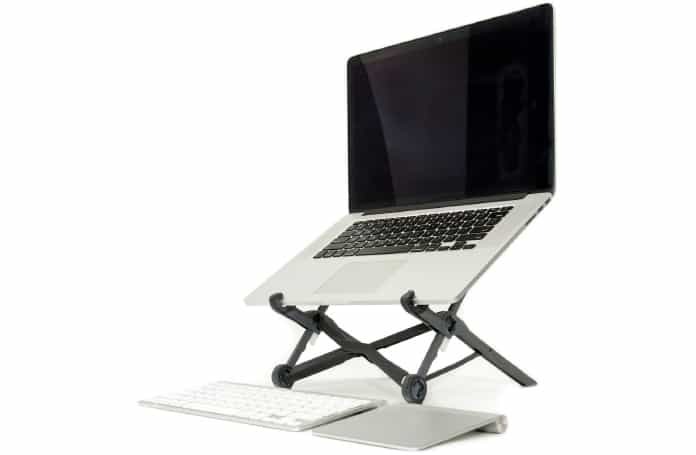 You can buy the Belkin Loft Laptop Holder for $39.95. 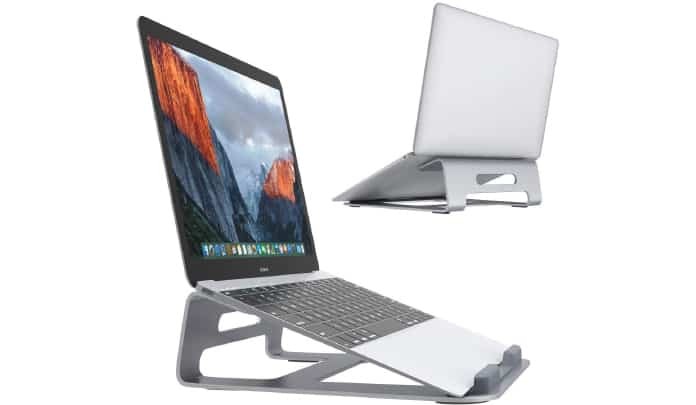 The SLYPNOS aluminum laptop stand from Twelve South will keep a MacBook at an angle of 18-degrees, which is ideal for prolonged typing activities. Its stand (made of aluminum), comes in both silver and black, which makes it an ideal match for those MacBooks. Additionally, it provides good airflow courtesy of its open-wedge design. Also, easy cable management is there among the other key features of the stand. It will cost $49.99 to purchase. These are some of the best MacBook stands available in the market. Regardless of the one you go with; you’ll be improving your existing experience of using Apple’s PCs.